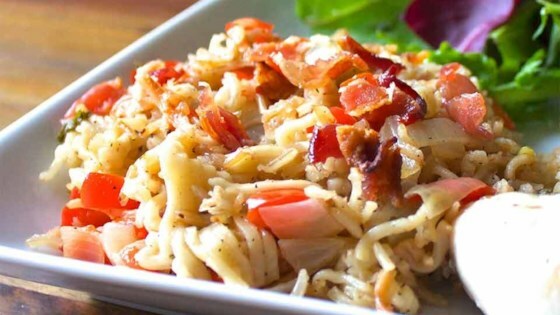 "Tasty rice and vermicelli sautéed in butter, simmered in Swanson® Chicken Broth and topped with bacon makes a great side dish with grilled chicken." Place bacon in a large skillet and cook over medium-high heat, turning occasionally, until evenly browned, about 10 minutes. Drain bacon slices on paper towels; crumble. Drain bacon drippings from pan; wipe out with paper towels. Heat 2 tablespoons butter in a skillet over medium heat. Stir in rice and vermicelli; cook until they turn a golden brown, about 4 minutes. Stir in chopped onions and bell pepper. Saute until the vegetables begin to soften, 2 or 3 minutes. Add Swanson(R) Chicken Broth, garlic, parsley, onion powder, garlic powder, and black pepper. Bring to a boil. Cover, and simmer on low heat until liquid is absorbed, 20 to 25 minutes. Top with cooked crumbled bacon.